Our luxury and fully-equipped 3 bed/3 bath condo is located in beautiful sunny South Maui in Kihei at the 'KAMAOLE SANDS', situated on a lush, tropical landscaped property and just across from the Kamaole Beach Park III, one of the most beautiful beaches on Maui. This condo has been completely remodeled in August of 2014. It is fully-equipped incl. all new Tempurpedic style mattresses (2 king plus 2 queen), full kitchen including microwave, ice-maker, dish-washer, washer/dryer, Air conditioning (in all three bedrooms and in the living/dining kitchen area) plus large ceiling fans. Flat Screen smart TV’s in all bedrooms as well as in the living room, cable TV, DVD, free wireless High Speed Internet access, Stereo, phone, large sectional with sleeping area in the living room, free parking and an adequate supply of linens, towels and beach towels to ensure your complete comfort. There are also two Pack-n-Play's available (free of charge). A starter-kit of Hand Soap, Laundry Detergent, Dish Soap, Toilet Paper & Kitchen Paper towels is provided. Shampoo, Conditioner & Shower Gel are personal items and are not provided, please bring your own. The condo is located in the desirable building #5, just steps away from the pool area and approx. 3 walking minutes to the beach. A large new sectional sofa in the living room, which can be converted into a sleeping area for two. This unit has and 2 private parking stalls (free of charge and right next to the elevator) and is fully equipped including an adequate supply of linens, towels, beach towels, beach chairs and a beach cooler to ensure your complete comfort. At the Resort there are eight barbecues, four tennis courts, a wading pool, sun decks and two separate Jacuzzis, a gym and an Internet center. Free group tennis lessons with a certified Teaching Pro every Thursday morning plus free "Drop in" tennis every day at 5pm to meet other players. The 'KAMAOLE SANDS' is just minutes from World Class Golf Courses at Makena and Wailea, and a short walk from shops and restaurants. Aloha and Mahalo nui loa from sunny South Maui. We're a German couple being fortunate enough to be full-time Maui-Resident since 1995. We manage our vacation rentals ourselves and live just a block away from the Kamaole Sands and so we are easily reachable! Located in Kihei,South Maui the Kamaole Sands is one of the best condominium properties with 15 acres of spacious and lush tropical landscaped grounds directly across the street from the Kamaole Beach Park III one of Maui's finest beaches. The buildings are block construction, very quiet and close to upscale Wailea and Makena, championship golf, ocean activities and walking distance to shops and restaurants. 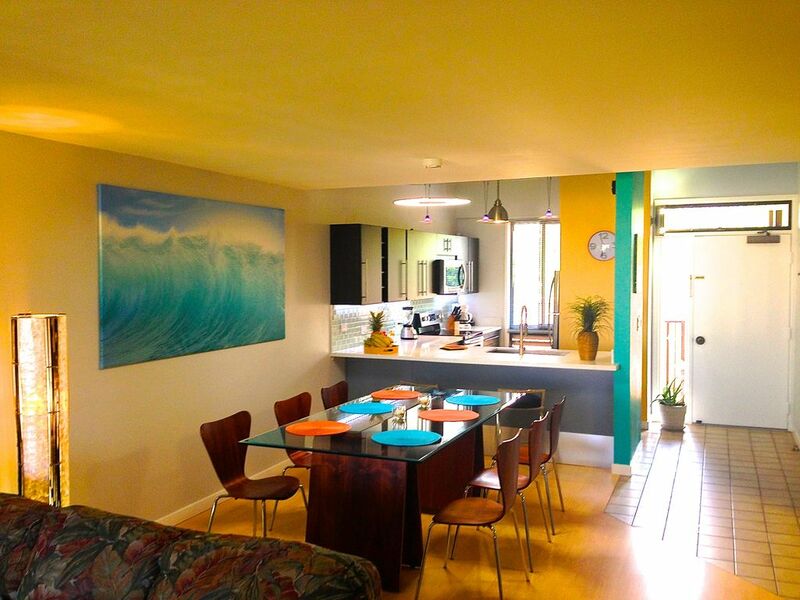 3 bedroom 3 bath units are very hard to find in South Kihei, and especially ones that are remodeled. This unit was completely remodeled in August of 2014. It is one of the largest units in the entire complex and near the beach. The Kamaole Sands is a popular property on Maui for visitors and is well known as kid friendly. It has a beautiful pool area with a children’s pool and two hot tubs at different temperatures . Each building has access to beautiful barbecue areas. There are also four regulation tennis courts on the property. There's on site tourist information, free adult computer use in the registration building, 24 hour security and even a small but efficient work out facility near the pool. The Kamaole Beach Park III is one of the best beaches on Maui, great for swimming, snorkeling and boogie-boarding. The grassy lawn area is often used for kids' birthday parties and weddings ceremonies. Kamaole Sands is within walking distance to shopping and restaurants and just minutes away from half a dozen World Class Golf Courses. Right across from the beautiful Kamaole Beach III, great for swimming and snorkeling. 2 Private Parking stalls right next to elevator.